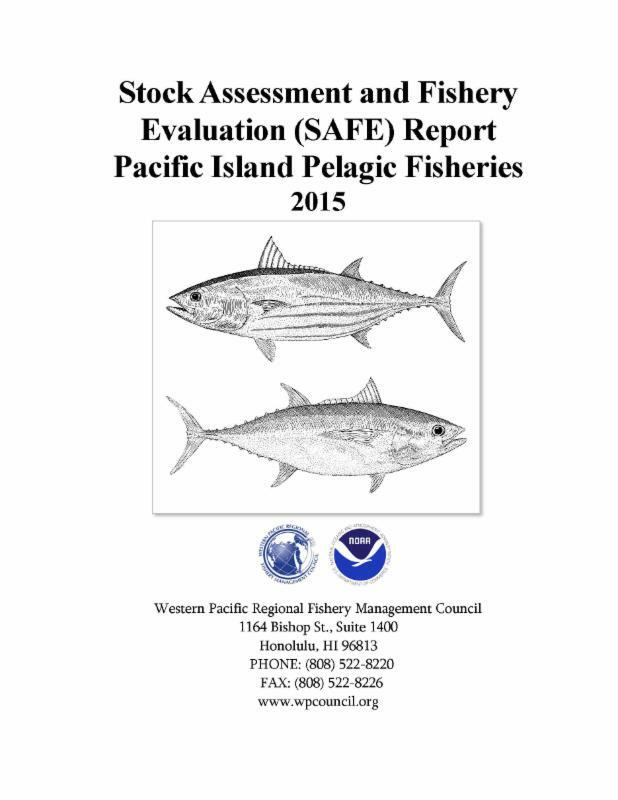 HONOLULU (7 Feb. 2017) The Western Pacific Regional Fishery Management Council is pleasedto announce the release of the 2015 Stock Assessment and Fishery Evaluation (SAFE) Report for Pelagic Fisheries of the Western Pacific Region. Pelagic fisheries are the single largest fishery sector in the region, accounting for more than 90 percent of the landings and value of commercial fish catches. Recreational pelagic fisheries and charter fisheries are also extremely important in the Western Pacific. Noncommercial catches of some species in Hawai’i, such as yellowfin tuna, may exceed the commercial catch. For-hire or charter fisheries are also very important in Hawai’i, where the charter fleet in Kona is the largest charter fishery in the world based on blue marlin. The Council has been generating annual reports on the pelagic fisheries in the region since 1987. Historically, they provided fishery performance data, including but not limited to landings, value of the fishery and catch rates for each of the areas the Council manages. “We are very pleased to see the completion of this Pelagics SAFE Report, as it covers the major fisheries in the Western Pacific from multiple reporting dimensions and does not just focus on catch and landed values,” noted Council Chair Edwin A. Ebisui Jr. The revised and expanded contents were completed by the Council in partnership with the National Marine Fisheries Service (NMFS) Pacific Islands Fisheries Science Center (PIFSC) and Pacific Islands Regional Office (PIRO) as well as local fishery resource management agencies. The SAFE report provides the Council and NMFS with information to determine the annual catch limits for each stock in the fishery; to document significant trends or changes in the resource, marine ecosystems and fishery over time; to implement required essential fish habitat provisions; and to assess the relative success of existing relevant state and federal fishery management programs. The report is intended to serve as a source document for developing fishery management plans (or fishery ecosystem plans) and their amendments and other analytical documents needed for management decisions. Under the authority of the Magnuson-Stevens Fishery Conservation and Management Act of 1976, the Council manages fisheries seaward of the state and territorial waters around American Samoa, the Commonwealth of the Northern Mariana Islands, Guam, Hawai’i and the U.S. possessions in the Western Pacific Region (Johnston Atoll, Kingman Reef, Palmyra, Jarvis, Howland, Baker, Midway and Wake Islands).